Out of the keg it’s quite hazy, but not yeastily so, I guess it’s the dry-hopping that’s done it. The head’s quite good, is snow white and hangs about a bit. A bit of lacing clings on merrily as you get further down the glass. Aroma-wise, I’ve learnt a big lesson here – and that’s not to use seemingly well-sealed, but opened, hops from the freezer for aroma additions. The Nelson Sauvin had gone past their best – meaning that we get plenty of hops in the aroma, but they’re not as fresh as I’d like them to be. It’s not to say that this beer is a disaster – everyone who’s tried it has liked it…but I know, and I can taste it’s deficiencies. I also think that for something this hoppy, S04 yeast was a mistake, it’s character is also far too evident in the taste and doesn’t seem to contribute a great deal. I have a couple of kit brews to do soon – all-grain kits from the folks at BrewUK, which I was bought for my birthday by the Jimster. I hope to get one of those on the go with him next week – that’s if my Belgian Saison ever stops fermenting. And as we were in Oxford we thought we’d do lunch at Byron’s – mainly because they know how to cook, can get kids’ food out at the right temperature and on time (i.e. straight-away) and also have a craft beer menu: it’s because of all of these things that I love them so. 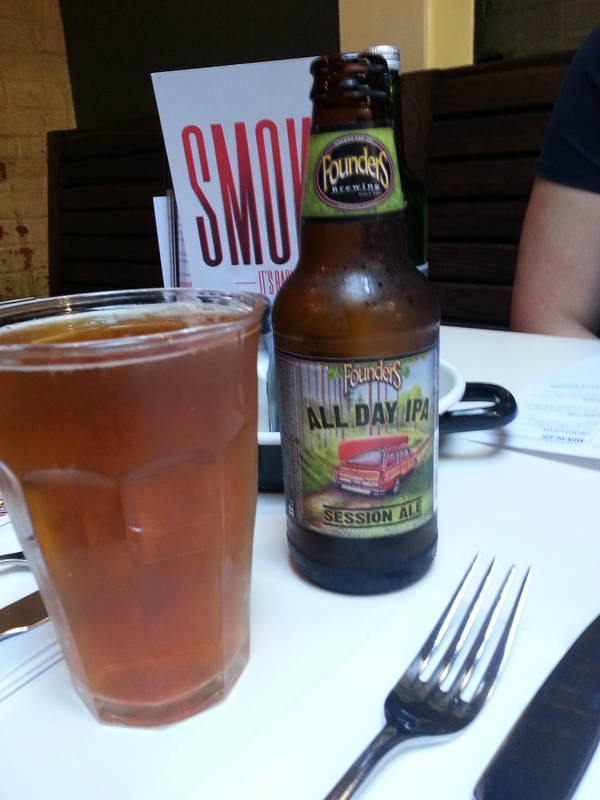 Amongst the very tempting things on the beer menu was Founders All-Day IPA. I’ve heard a lot about Founders and am gearing myself up to have a test and review of their Breakfast Stout – whenever I can get hold of a bottle. All-Day IPA is so-called because it’s a comparatively weak (4.7%! ), sessionable, interpretation of a standard US IPA. But being less-than 6% doesn’t make it any less of a beer, not by a long chalk. Arriving classically IPA hazy and a typically orangey-copper colour, it looked just right. The head was sea-foam slick and told me good things were in store. The aroma was marvellously hoppy and, although I couldn’t pin down any exact varieties, there seemed to be evidence of the famous “C” variety hops in there (Cascade, Centennial, Chinook, etc.) as there was florality, citrus and pines galore. Taste-wise, you wouldn’t have known that this was a sub-6% beer: rich and chewy malts with a really great mouth-feel reclined back on a huge bed of solid hoppiness. So there I was yesterday evening; poised at the front door for the 8.30pm – 9.30pm free delivery slot (as well as being very now, we’re also very tight). Coiled like a spring I was ready to dive into the bag and liberate this beer for review and thirst-slaking. Delivery-bloke had barely got the bag through the door before I had the bottle out, cap off and into a glass. Ah. It’s a “filtered” wheat beer. In the Kristal Weizen style. I was looking forward to tons of yeasty fruitniess, coriander, some phenols – the whole lot; but, what I actually got was a startlingly clear, not at all yeasty, beer. Oh well. The aroma was very gentle malts (and wheat, I guess) and muted yeast aromatics. Some straw, herbalness, maybe some drying hay and a suggestion of rubber or bubblegum. Taste-wise it was brightly effervescent…and then nothing…for quite a while. The some graininess came in. Some spiciness followed. clutching a few herbal notes in it’s hand. I got more fruitiness on the after-taste. The aroma was way better than the taste. Shame, really. Next time I’ll definitely go for Franziskaner or Weihenstephaner. Mit hefe.! Here’s a beer that you see all the time, but probably don’t pay a great deal of attention to. Like the poor, death and taxes – Marston’s Pedigree will always be with us…but in an understated, unobtrusive sort of way. Arriving a very pleasant chestnut-brown colour and topped with the whitest of heads, it certainly looks the part. Good. 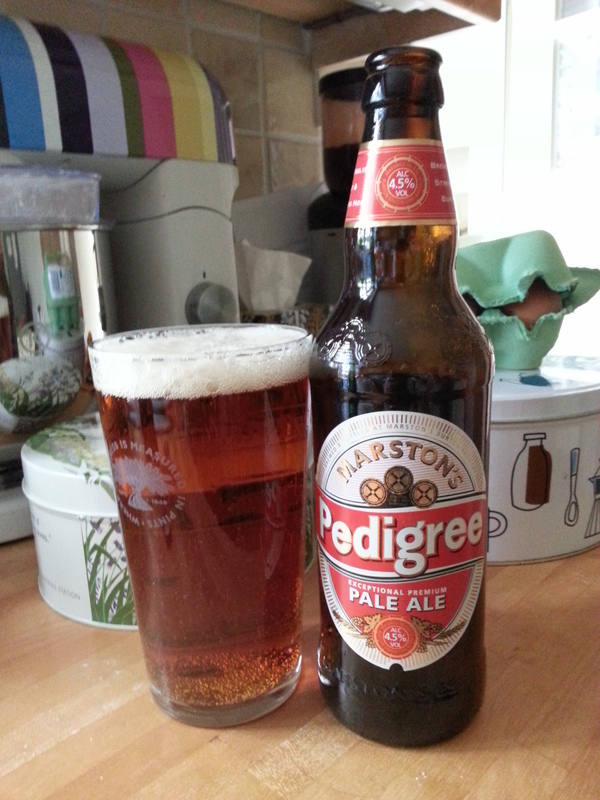 Pedigree is by no means a complex drop, it’s not in possession of a huge and satsifying malt body, either. It’s just a good beer. Not revelatory or world-shaking. It’s honest, solid, tasty and refreshing. A rounded malty-nuttiness (or nutty rounded-maltiness) completes the picture. I know the title of this article is a bit of a cheeky play on the title of this famous tome from Dave Line: http://www.amazon.co.uk/Brewing-Beers-Those-Amateur-Winemaker/dp/1854861255 but it’s entirely appropriate. I tend to brew beers that are completely unlike anything that I can buy – at least in the UK: when was the last time you found a Grapefruit Belgian Saison, or a Citra and Nelson Sauvin India Pale Ale in Sainsburys? Trying to get beers completely to your taste is fun, at times irritating, and at other times completely bewildering to others when they taste it. After my attempt at a massively over-the-top hopped interpretation of Thornbridge Kipling (https://yeastismybitch.com/2013/11/12/homebrewed-thornbridge-kipling-clone-braumeister-version/), I was asked “Is that really metallic taste the hops in it?” and dear old Jim was right, it was. Double the quantity of aroma hops and half-as-much again of flavour hops did tend to produce a metallic note in the taste, a taste that took at least three weeks to a month to iron out – after that it was a thing of beauty and is now one of the most hit recipes on YIMB. It’s one of the few recipes that I intend to make completely unmodified again. When I do brew it up, I’ll save a couple of month-old bottles so that Jim can enjoy the mellow taste when the beer eventually comes right. But it just goes to show how difficult it is when trying to get things just so. I’m currently agonising over whether to “dry-hop” another grapefruit’s worth of zest into the Saison. It’s been fermenting for just over ten days now and a considerable bubble is still coming through the airlock every 15 seconds. Will it ever stop? US-05 would have killed that wort to 1009 in four days, no worries. 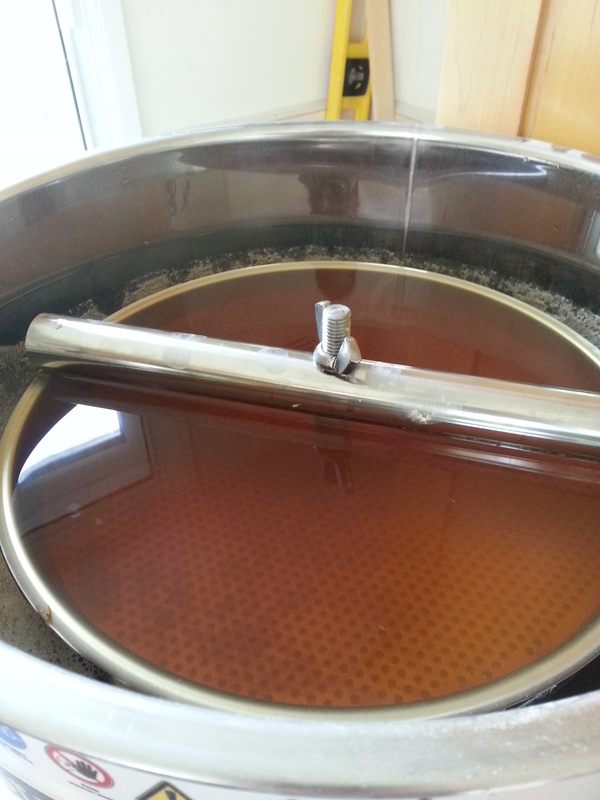 But I’m patient, and the taste of the small amount I stole from the fermenter was good (and 1014, so a bit to go) – but will it benefit from more grapefruit zest? 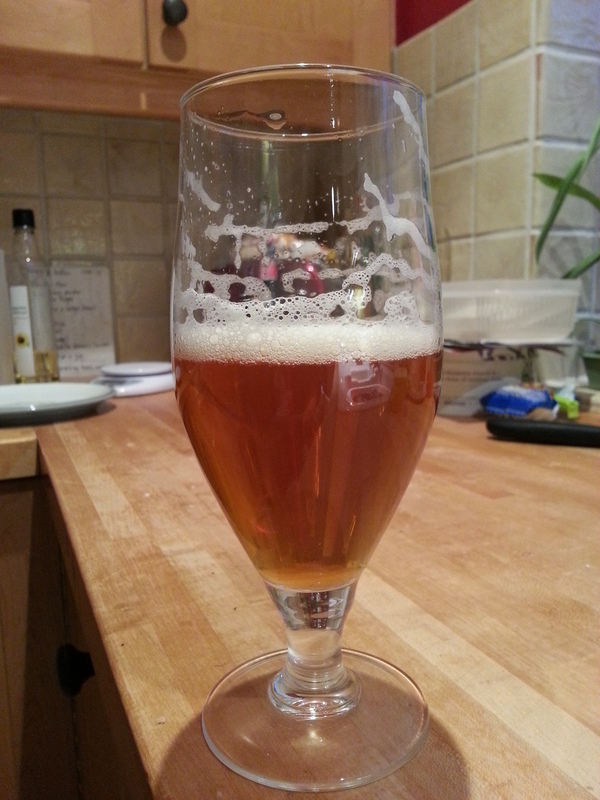 Likewise, my Citra and Nelson Sauvin Universal Sanction IPA (which I’ve yet to properly evaluate and rate) tastes kinda like it should; but would it have been cleaner and more hop-shiney with US-05 instead of S04? The S04 ripped through the wort in extraordinary time but has left me with quite a different IPA experience, which is good but maybe not what I was looking for. Dave says it’s quite nice, and he’s a seasoned ale drinker, so maybe it is. Next time I’ll try another liquid yeast. Maybe I’ve had it with dried yeasts and am looking for something more complex, that only Wyeast and White Labs can provide? On other blogs and in other news, this piece: http://www.themadfermentationist.com/2014/08/blonde-ale-on-coffee-beans-recipe.html by Michael Tonsmeire on his The Mad Fermentationist blog has reminded me that I need to get brewing something dark for the Winter. And Michael’s method of dumping coffee beans directly in the fermenter sounds like a good, hassle-free, way of getting a Breakfast Stout (Coffee and Oatmeal) on the go. I quite fancy some vanilla pod-action in it too. Eve bought me this bottle when she last went to Sainsbury’s for the weekly groceries. Now she’s gone back to work we get Ocado deliveries, which means much nicer and interesting food choices, no bag-lugging and a much more entertaining beer selection. But that’s by the by and by. 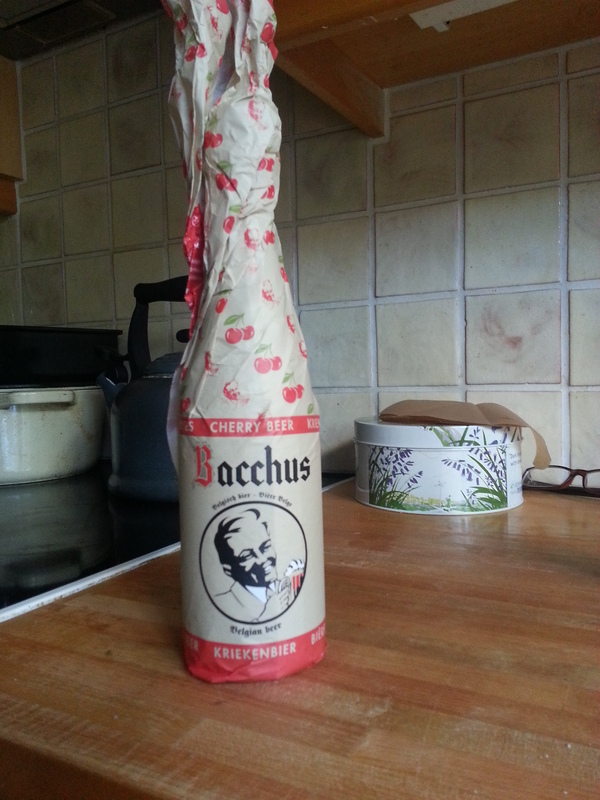 Bacchus Kriek. What a lovely, gothic-thriller of a beer. The taste is luxuriously sweet and sharp with cherries, cherries, cherries; all dark, beguiling and inviting, fresh cigar box and leathery bookishness. 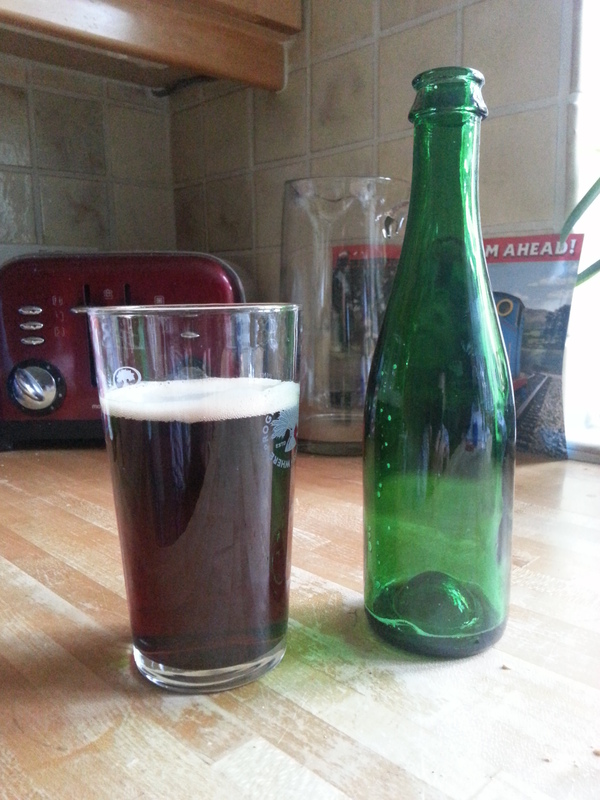 Beautifully carbonated and without the thinness of body that lambic-based beers tend to have. The after-taste is that of lasting dark cherries, sweetness and sour, and just the faintest musty attic that these beers should have. Simply beautiful and perfectly put together. If ever there was an excuse to don a velvet smoking jacket and recline in a leather wing-back chair, this is it. I cannot fault Bacchus Kriek. Complex and eminently ponderable. Get some in for Halloween. So, this Friday lunchtime – as it was just Karl and I who were interested in the pub – we decided to shoot across to Witney and see what Wetherspoons (The Company of Weavers) had to offer. Bengali arrived a thickish-looking, hazy autumnal-sunset colour. Good solid maltiness and resinous dank hop aromas poured from the glass – all accompanied by quite a heady warm alcoholic note from the 6.5% ABV strength. The mouth-feel is slab-solid, making this feel like a “big” beer. A hefty bitterness-hop tumult assaults your tongue and leads through to a chewily resinous, dankly-hoppy and warmly-alcoholic experience. The after-taste is strong and long-lasting and is solid malt, prickly-pine resinous hops and that life-affirming, sustaining, bitterness. 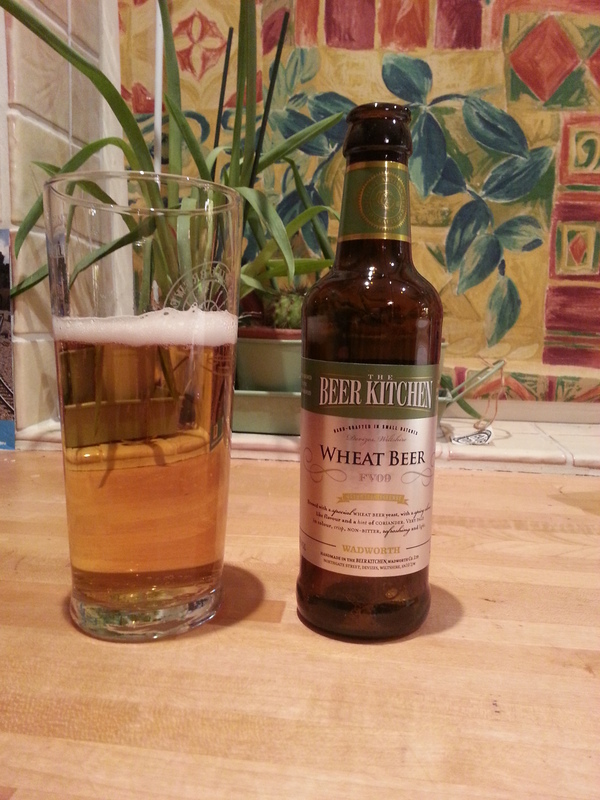 In my opinion Wetherspoon’s served this beer just a little too cold for my liking – as over the course of a half-hour or so, the fruitiness of the flavours and aromas developed even more potency and vibrancy. 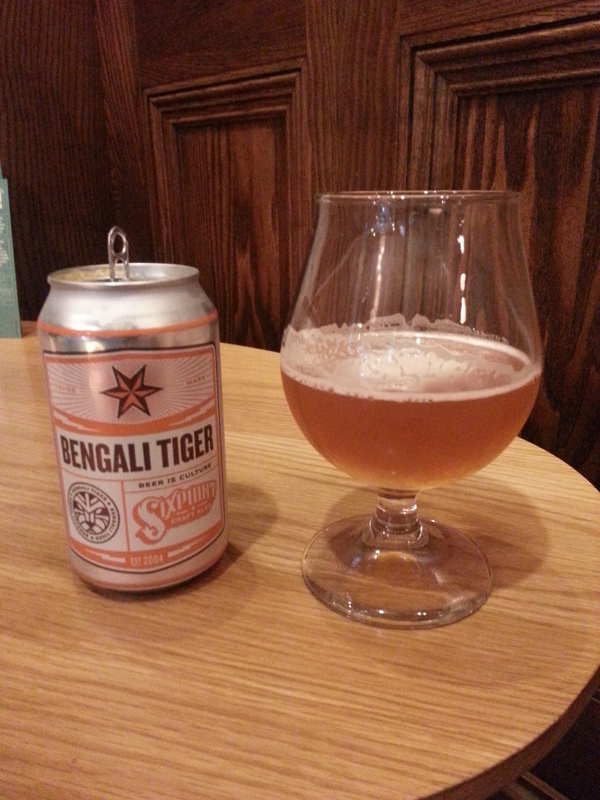 Bengali is definitely more of a handful than Sweet Action (reviewed here: https://yeastismybitch.com/2014/08/04/lunchtime-lubrication-six-point-sweet-action/) but is just as dangerously drinkable.